Within the public and private areas of a home, Chinoiserie décor elements can make spaces come alive with opulent colours and patterns. In a dining area, a majestic feature wall framed by slim slivers of light brings focus to the space and serves as an elegant art piece that complements the stately dinner table and chairs. Likewise, Chinoiserie-inspired patterns add a touch of sophistication to the cabinetry and furniture pieces and provide a statement-making backdrop to a small seating area. 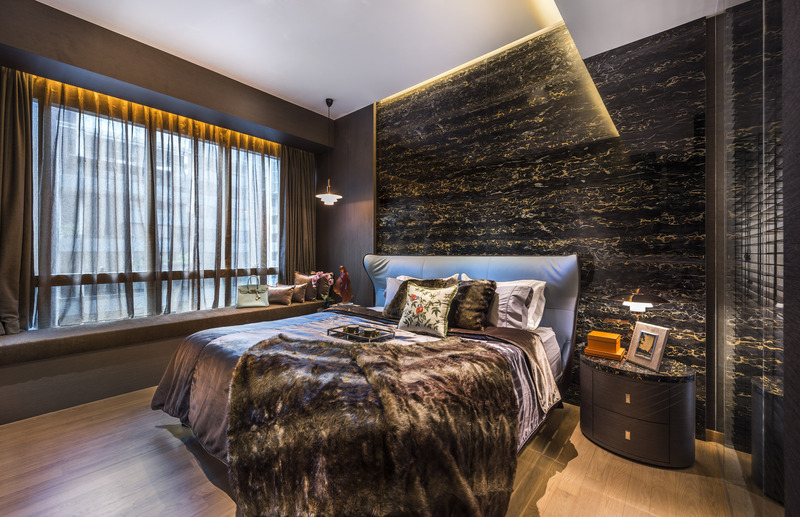 Dramatic and statement making, further enhanced by accent cove lighting, Magma Gold granite is an immediate grand gesture, bold in its pattern and application. 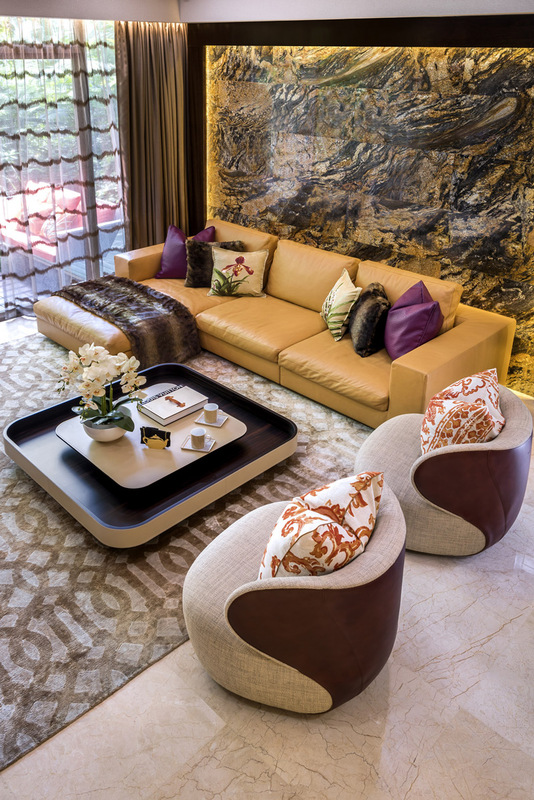 Its sweeping waves of black and gold remind of an artist’s brushstrokes and provide a complementing backdrop to the classic brown leather Walter Knoll sofa and sensuous Potrona Frau table. 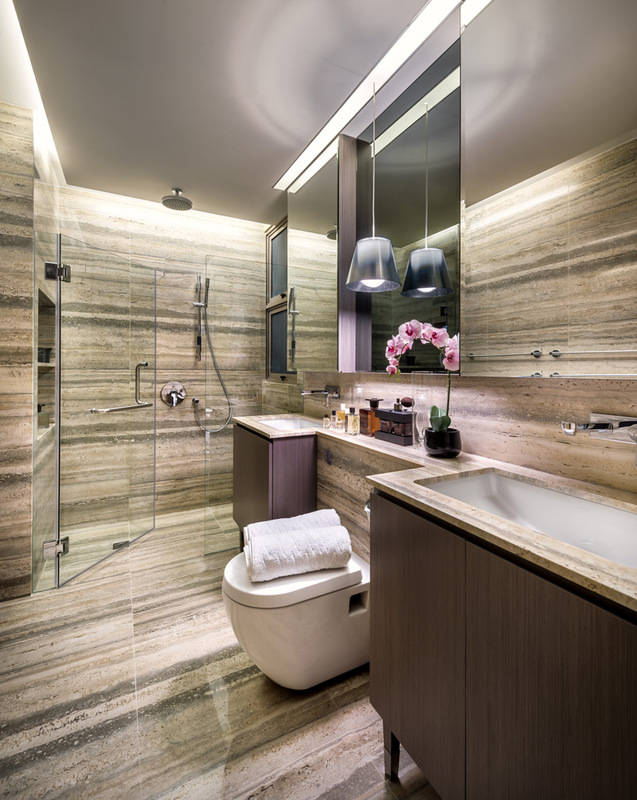 The even bands of beige and grey tones of Silver travertine running parallel to the floor and ceiling of a bathroom are soothing and calming to the eye, lending some earthy undertones, while visually elongating the space. With the subtle creme background and decisively directional grains, the stone is the epitome of contemporary opulence, serving as a statement feature while complementing the more subdued vanity and mirror pieces. An incredible black marble with pronounced gold and silver veins, Portoro Gold is a truly classic stone that has been used since Roman times as a pure embodiment of luxury. Striking on its own, Portoro Gold is remarkable when used in controlled quantities, for countertops or feature walls. Here, Portoro Gold is an elegant solution to a luxurious bedroom setting, complete with a leather bed with a baby blue headboard for a visually stunning contrast. Glowing and ephemeral, onyx has the virtue of transforming its appearance from day to night, transmitting warm, pleasant glow through its layers of parallel and contrasting translucent shades, when backlit. 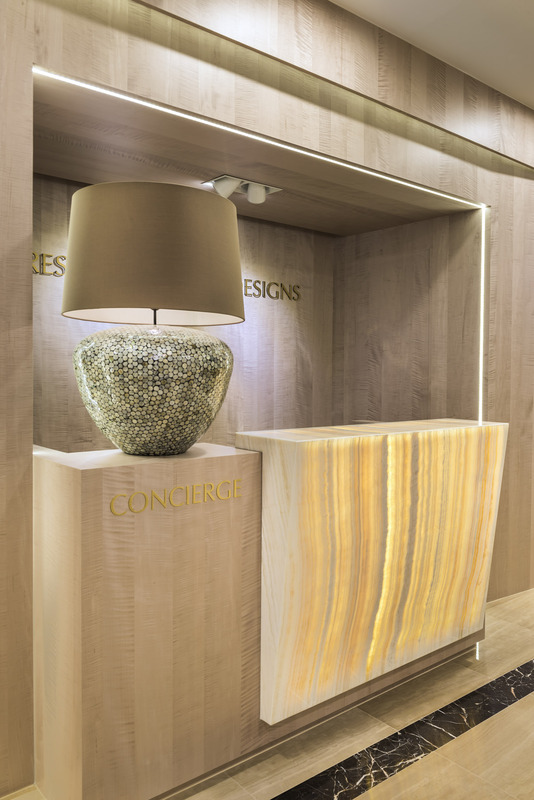 Honey onyx, a feature element in the Prestige Global Designs’ office concierge, is striking as an entrance piece, emitting a welcoming glow to the arriving guests. Opulent through and through, the pure splendour of onyx can be a real head turner, standing the test of time with its extraordinary aesthetic properties and natural beauty.